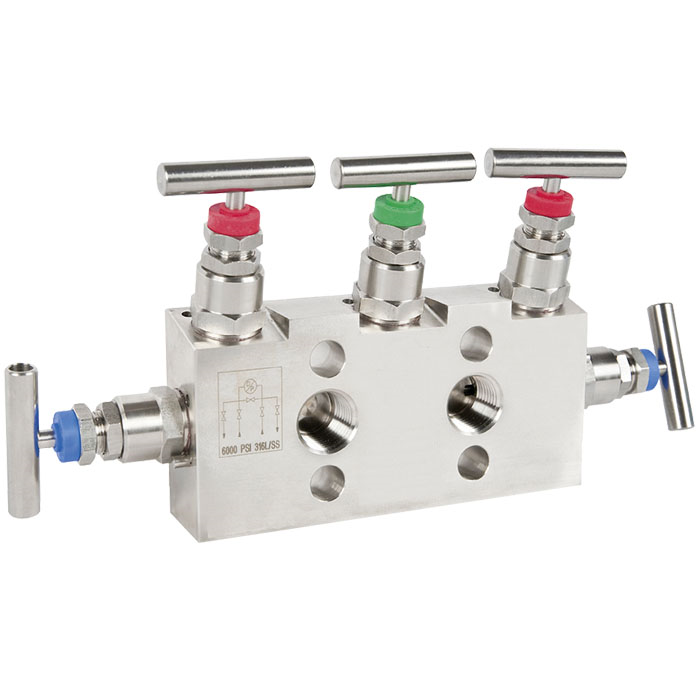 The 3-valve manifold consists of two shut-off valves and one pressure compensating valve. The shut-off valves separate the process from the differential pressure measuring instrument. The pressure compensating valve enables the compensation between ⊕ side and ⊖ side to avoid one-sided overpressure during commissioning and operation. Compared to the 3-valve manifold, the 5-valve manifold is equipped with two additional vent valves. 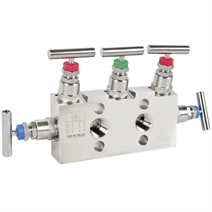 One vent valve per pressure side allows operators the targeted venting of one or both pressure sides of the measuring arrangement. Through the non-rotating spindle tip, the wear of the sealing elements is reduced. This results, particularly with frequent opening and closing, in a noticeable increase in the service life of the valve manifold. Through the blow-out proof design of the valve, working safety is improved, especially in applications with high pressure loading.